Order now before we price out the new shipment! We expect prices to go up due to freight costs. NOW AT THE LOWEST PRICE ON THE WEB! Stéfani Cartridge is considered one of the world's most efficient water treatment. Stéfani water filters were the first to receive the certificate INMETRO (National Institute of Metrology, Quality and Technology). ~ Water sources: tap, well, river, lake, stream can be used. Not for use with salt water. ABOUT FLUORIDE REDUCTION In Toronto, ON CAN the water coming out of our treatment plants has only 6 PPM Parts Per Million of fluoride. The EPA considers a safe level to be 20PPM. Removing 10% of 6PPM therefore removes fluoride below detectable levels. For example, Adya Clarity reduces fluoride salts to 5PPM. The <.5 micron size micro-porous ceramic wall filters water drop by drop without the addition of chemicals, reducing impurities and retaining solid particles, ensuring healthy water and free of microorganisms. 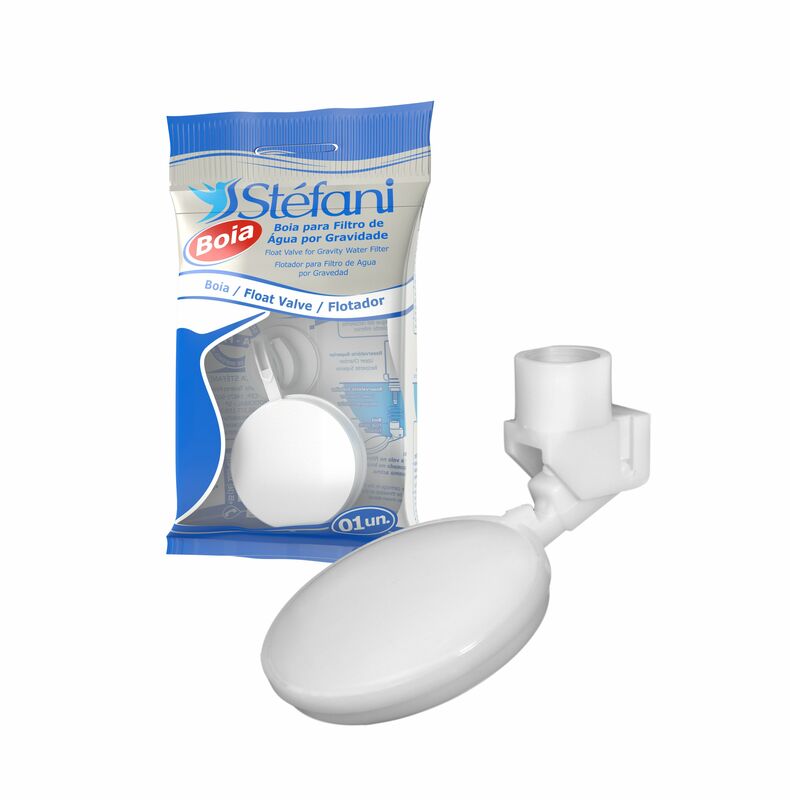 Stéfani Cartridges are compatible with all market gravity filters. There is no safer, more affordable way to provide clean water and ensure health and wellbeing. Triple Action - Dechlorinating and sterilizing, with colloidal silver coating, applied on the inside of the cartridge, with the activated carbon, working to filter and reduce odours, tastes and chlorine, as well as reducing the presence of bacteria in the water. The internal colloidal silver layer penetrates through the pores of the candle, preserving its sterilizing property. 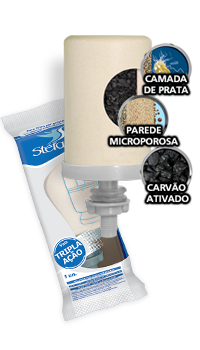 The revolutionary Stefani Traditional triple action filter, with colloidal silver and activated charcoal, filters the impurities, eliminating bacterias and microorganisms, reduces odours, flavors and the quantity of chlorine in water. The Stefani Clic Taps are manufactured following a universal pattern and are compatible with all filters models, supports and reservoirs on the market. The clean, tamper-proof packaging ensures safety and quality. 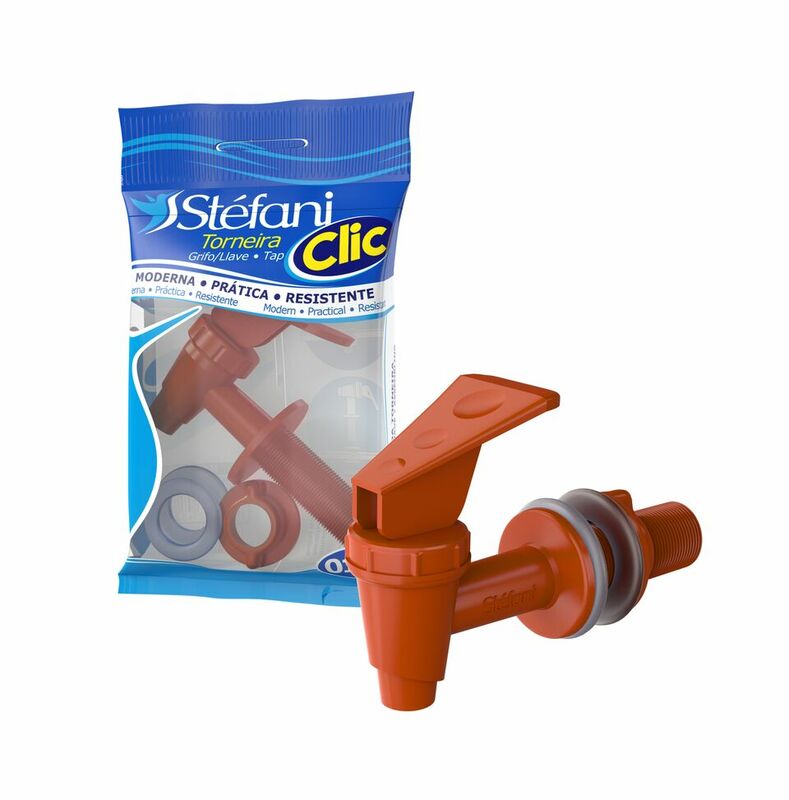 Practical, easy to install and durable, the Stéfani Clic Taps provide excellent water flow, with a modern design and terra cotta colour to match your filter and environment. 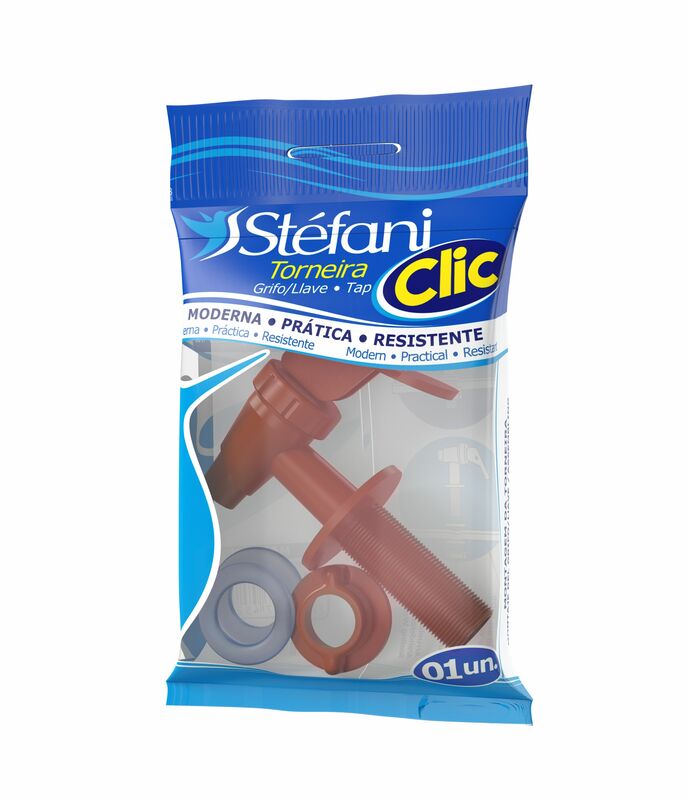 All Stéfani gravity filters are equipped with Stefani Stefani Clic Taps, compatible with most filter models, supports (carriers) and reservoirs on the market. ~ Doubles the capacity of the filter. ~ Installs in seconds without tools. 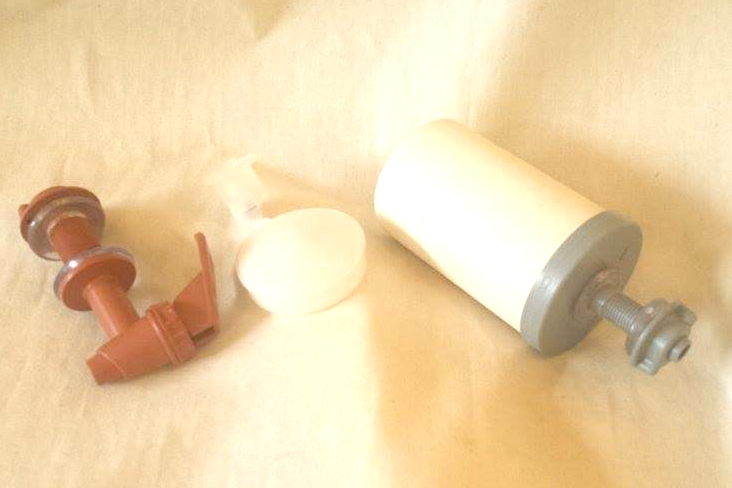 Easy to install; screw the float to the threaded end of the water filter cartridge. Finger tighten; do not use tools! If you have multiple filtres, arrange the attached float valves so that they do not touch each other or the sides of the water purifier. Water crocks come with all parts and filters needed. Most clients order a set of filters so that they are set for a whole year. Taps and floats do not need replacement unless accidentally broken, or after many years. Please clean them and their washers with plain water and a non metallic scrubber at each filtre change, though! REPLACEMENT Any part which is found to be defective after we've gone over trouble shooting by phone or email will be replaced at our expense. Efflorescence and other maintenance issues, breakage once you have taken possession, or from forceful installation will never be a reason for return. Stefani Terra Cotta Water Purifying Crocks come complete with filters, tap, and float valves. and the tap and floats will only need to be replaced if accidentally broken, or after many years of use. The replaceable Stefani Traditional triple action filters last up to 6 months or 700 litres of water filtered. 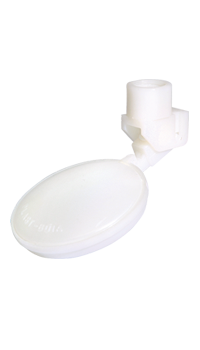 Conventional water filtering jugs offer replacement filters that last only up to 6 weeks and are often made of hormone disrupting plastic. The ceramic wall on the replacement filters offer superior filtration of 0.5 microns which is like a fraction of a particle of sand. This removes most impurities from your water not offered by popular solutions. Used worldwide for its excellence in design and water purifying qualities in countries like US, England, Australia, South Africa, Peru and others. Respected and used extensively by Non Governmental Aid Organizations as an affordable solution to provide clean water to under-privileged areas of the world. 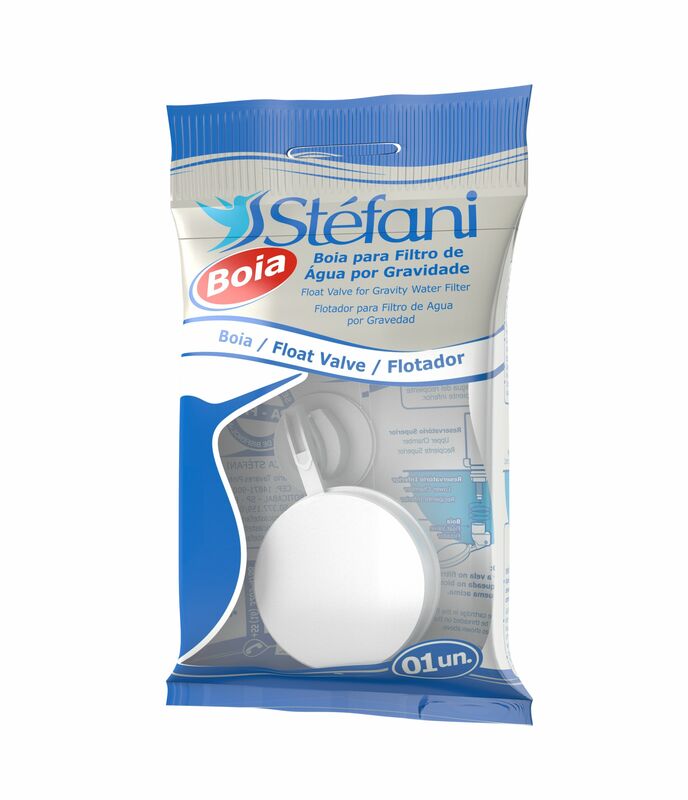 I am presently the only supplier of Stefani water crocks, filters, and replacements parts: float valves and taps in North America!!! I will always carry filtres and replacement parts because I am committed to my two water crocks for the production of natural cosmetics and for my family, and to my clients who have purchased water crocks from me. FILTRES ARE ALWAYS IN STOCK! Replace filters every 6 months or 700 litres, whichever comes first. WATER FILTERING SLOWLY BEFORE 6 MONTHS? If your water is filtering very slowly before that time, that's good news - your cartridge has trapped a lot of metals and larger particles because your water is hard or dirty. 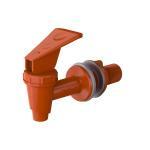 Simply remove the filtre cartridges and scrub with a non metallic scrubber in plain running water. Your cartridge has trapped a lot of metals and larger particles, but your filtred water will be purified!